The church was growing and Barnabas was sent to Antioch to check on them, and “when he came, and had seen the grace of God, was glad, and exhorted them all, that with purpose of heart they would cleave unto the Lord.” (Acts 11:23) He then went on to Tarsus, seeking Saul. “And when he had found him, he brought him unto Antioch. And it came to pass, that a whole year they assembled themselves with the church, and taught much people. And the disciples were called Christians first in Antioch.” (Acts 11:26) The name Christians started out as a nickname, but became a means of identifying those who lived and behaved like Christ. What a great example the early church sets for us through all time. Would that today’s churches would actually behave Christ-like as did the early church. So we see most clearly that the early Christian church was a praying church. Now we will take a look at the woman Mary, the mother of John Mark, who graciously opened up her home to Jesus’ disciples and early church. Scripture mentions Mary only one time. During the persecution of Herod Agrippa, this brave woman offered her house to the first group of Christians at Jerusalem as a place to worship God and to pray. Mary was a woman of means, with servants and a house large enough to accommodate the entire Jerusalem congregation. Since Scripture records no husband, Mary was probably a widow. Times proved difficult for Christ’s followers during those early turbulent years. 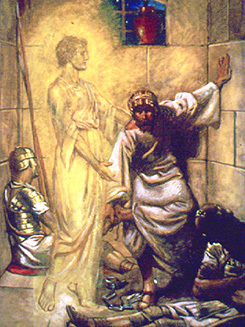 Herod Agrippa had imprisoned Peter after killing James, the brother of John, with the sword. Yet, in spite of the risks involved, Mary courageously opened her home regularly to Christians. After an angel miraculously escorted Peter from prison, he went immediately to Mary’s house, a familiar place of hospitality for the disciples. There he found the entire congregation praying for his release. With the fearless example of a mother like Mary, it really is no wonder that John Mark became a missionary, church leader, and the author of the second Gospel.